Choreographer, artistic director, dancer, teacher, writer. Born: March 30, 1948, Boston. Jeanne Robinson began performing at five, choreographing at eleven, and teaching at fifteen. That year she discovered modern dance. "It allowed me," she says, "to invent new ways of moving and new ways of looking at dance." She studied at the Boston Conservatory, the Martha Graham, Alvin Ailey and Erick Hawkins schools, Nikolais/Louis Dance Theatre Lab, Toronto Dance Theatre, and the American Dance Festival, among others. She also studied under Hawkins principal dancer Beverly Brown, and performed with her company, Beverly Brown Dancensemble, at the 1981 Riverside Dance Festival in New York. A child of the 60s, Robinson moved to Nova Scotia as part of the back-to-the-land movement in 1972, and taught, choreographed and danced throughout the province, both as a solo artist, and with Halifax Dance Co-Op and Halcyon Dance Theatre. In 1979 she founded DancExchange Studio in Halifax, offering classes in modern, jazz and ballet; she also choreographed several Neptune Theatre productions. After two seasons of mounting her own choreography under the name Jeanne Robinson Dance Project, in 1980 she founded Nova Dance Theatre, the province's first and so far only professional repertory modern dance company. During its seven-year history, NDT produced critically acclaimed concerts twice a year at the Dalhousie Arts Centre, performed school shows throughout the province, and toured the Maritimes and Newfoundland. CBC's hour-long national broadcast of highlights from the 1985 Dance In Canada Gala devoted its final twenty minutes to NDT's performance of Robinson's FICTON. 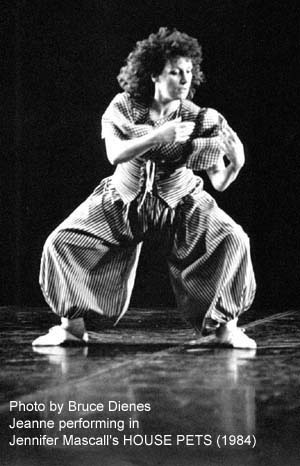 In addition to her own work, Robinson consistently offered NDT as a venue to emerging regional choreographers like Francine Boucher, Diane Moore, Leica Hardy, Gwen Noah, Duncan Holt, and Louise Hoyt, and also commissioned works from out-of-town artists such as Beverly Brown, Barbara Dilley and Jennifer Mascall. A spiritual seeker who is now a lay-ordained Soto Zen Buddhist, Robinson speaks of her dances as "moving koans, visual parables that came to me and demanded to be realized." After seeing her dance, her Zen teacher, Tenshin Reb Anderson, named her Buchi Eihei-dancing wisdom, eternal peace. Works such as reMembering (1981), Dance for Changing Parts (1982), Grecia (1985), and Indices of Refraction (1985) reflected her ongoing spiritual inquiry, but it was not until Zenki-zu, created for Vancouver's 1992 Women In View Festival, that Robinson permitted herself any overt references to Buddhism. Her work was noted for its ingrained optimism, warmth and wry humour as much as for its spirituality and theatricality. Sometimes narrative (Porch, 1979), sometimes pure movement (Hey Rhythm, 1983), it was often set to original music commissioned from local composers. Bob Atkinson and Sandy Moore, for example, collaborated on the score of Walkwidow (1985), described by Atlantic Magazine as a "showstopper...a serene fever-dream of loss." "It's not unusual for Robinson to think in cosmic terms," the Globe and Mail said in 1985. "In the seventies she created the concept of zero-gravity dance in the Hugo Award-winning novel STARDANCE, which she wrote with her husband, science fiction writer Spider Robinson." In 1980 NASA asked her to dance in space, aboard its Space Shuttle-an invitation withdrawn when the Challenger explosion ended the Civilian In Space Program. After five years' assurances by the Canada Council that NDT would be funded once it reached the "national standard of excellence," in 1985 Robinson was told NDT had reached that standard, but no funds were available. Exhausted by the constant fund-raising struggle, and having reached the end of her own performing career, she closed the company in April 1987, a major loss to the Atlantic region's dance community. Moving to Vancouver with their daughter Terri Luanna, the Robinsons co-wrote a sequel to Stardance titled STARSEED (1991), about a dancer forced into retirement, eventually followed by a third volume, STARMIND (1995), which featured an orbiting dance company called Nova Dance Theatre; all three books are considered classics of modern science fiction, still in print in several languages. Bibliography: Shannon Rupp, Writers Dance Into Outer Space, the Georgia Straight, August 4-11, 1995. Deirdre Kelly, Nova Sees Its Star Rising In The East, the Globe and Mail, October 18, 1985. Pamela Anthony, Jeanne Robinson: A Passion for Dance, Dance In Canada, Fall 1984. Deborah Jowitt, Aurora, The Village Voice, September 17, 1979.